Tawny Hats first appeared on Chictopia's streetstyle gallery in Winter 2011 seen on Hollywood blogger style4style of asimplev.blogspot.com. She styled her tawny American App floppy hat with a salmon Topshop dress and burnt orange vintage tooled leather bag. Since then, Tawny Hats have grown in popularity as bloggers from Lyon, Longmont, Colorado USA, and Withington have discovered them. 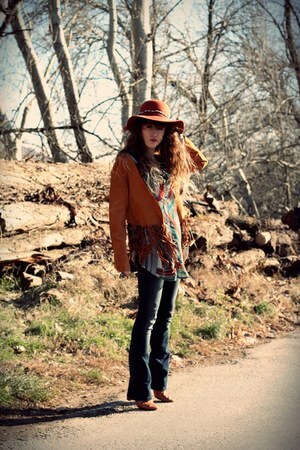 Tawny Hats are generally seen in vintage, casual, and chic style. Popular brands of Tawny Hats are asos, Target, Topshop, Urban Outfitters, and vintage. There are currently 136 streetstyle photos of bloggers wearing Tawny Hats. Most recently, blogger selectivepotential of selectivepotential.com rocked her tawny Aldo hat with a tawny wolverine 1000 mile boots, black Aeropostale jeans, and olive green Levi's jacket.